Registrations completed by the end of the day on February 29. When the heart and mind awaken, we have the potential to recognize the Buddha within each of us and to commit to live more intentionally in the world. 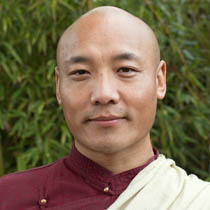 In the gentle process of this non-residential meditation retreat, held during the Christian Holy Week, Tibetan Buddhist Teacher Anam Thubten makes the connection between the essential Buddhist practices of meditation, loving kindness, no self, emptiness, and devotion, and living the engaged and compassionate way of the Bodhisattva. The great witness of the life and death of Jesus Christ provides an important thread woven into this retreat’s process. Embodying Compassion in Sacred and Challenging Times provides a focused atmosphere to journey inside oneself to awaken innate wisdom and courage so as to more fully embody compassion. You are warmly invited to experience Anam Thubten’s teachings during this third visit to Louisville. Come, learn and open your heart to an added dimension for your inward and outward journey. Seekers of all religious traditions are welcome. Special Registrations and Partial Scholarships available. If you are in need, please inquire by writing DrepungGomang Compassion@gmail.com. Cancellation Policy: A $10 fee deducted from the payment covers our charge and processing costs. No refund, please, after March 15th. Presented by DGCEC in partnership with the Dharmata Foundation. Anam Thubten grew up in Tibet and at an early age began to practice in the Nyingma tradition of Tibetan Buddhism. Among his many teachers, his most formative guides were Lama Tsurlo, Khenpo Chopel, and Lama Garwang. He is the founder and spiritual advisor of Dharmata Foundation, teaching widely in the U.S. and occasionally abroad. He is also the author of various articles and books in both the Tibetan and English language. His books in English include The Magic of Awareness and No Self, No Problem.